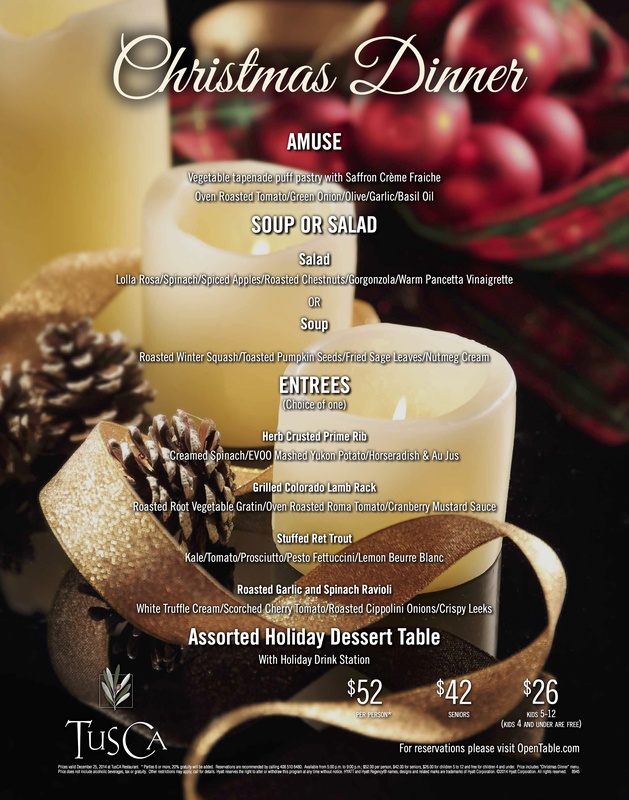 Join us for a Christmas Dinner with you and your family. You will start off with a Vegetable tapenade puff pastry with Saffron Creme Fraiche, Oven Roasted Tomato/ Green Onion/ Olive/ Garlic/ Basil Oil. Next will be a Soup or Salad. The salad is a Lolla Rosa/ Spinach/ Spiced Apples/ Roasted Chestnuts/ Gorgonzola/ Warm Pancetta Vinaigrette. The soup you could enjoy would be Roasted Winter Squash/ Toasted Pumpkin Seeds/ Fried Sage Leaves/ Nutmeg Cream. There are four options for the entrees. The first includes Herb Crusted Prime Rib with creamed spinach/ EVOO Mashed Yukon Potato/ Horseradish & Au Jus. Next option is Grilled Colorado Lamb Rack served with Roasted Root Vegetable Gratin/ Oven Roasted Roma Tomato/ Cranberry Mustard Sauce. The Stuffed Ret Trout includes Kale/ Tomato/ Prosciutto/ Pesto Fettuccini/ Lemon Beurre Blanc. Lastly, there is a Roasted Garlic and Spinach Ravioli with White Truffle Cream/ Scorched Cherry Tomato/ Roasted Cippolini Onions and Crispy Leeks. For dessert there will be an Assorted Holiday Dessert Table with Holiday Drink Station. It will be $52 per person, $42 for seniors and $26 for Kids 5-12 (kids 4 and under are free). For reservations please visit OpenTable.com.